Since the October 2011 implementation of debit fee interchange regulation under the Durbin Amendment to the Dodd-Frank Wall Street Reform and Consumer Protection Act of 2010, experts have kept an eye on its fiscal impact on banks, merchants and consumers. 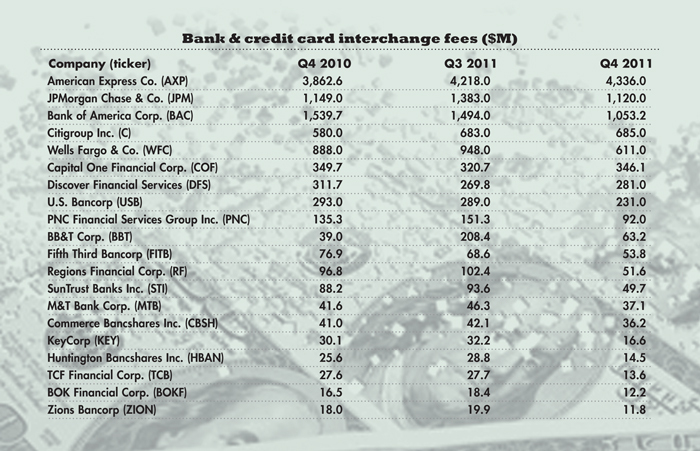 The regulation limits debit interchange fees charged by banks with assets of $10 billion or more to an average 24 cents per transaction, down from the prior average of 44 cents. SNL Financial LC monitors the 20 largest U.S. public bank holding companies based on quarterly regulatory filings. "As predicted, the Durbin limits had a noticeable impact on some banks, while other large financial institutions like American Express Co. and Citigroup Inc. were left relatively unscathed because they either do not issue debit cards, or debit interchange revenue is not a meaningful source of income for the companies," SNL stated in a recent report.